As if there wasn’t enough to concern yourself with in the wake of a divorce and child custody process, you also need to remember that the little things you do or don’t do can have a significant impact. It can have a significant impact on your child custody arrangement. It can have a significant impact on your children. Did you notice how I didn’t specify whether that impact is positive or negative? That’s because it’s up to you what the end result will be. Parents need to be extra vigilant and avoid speaking poorly of the other parent. Parental alienation (PA or PAS) isn’t always overt and obvious. Sometimes, it may not even seem to be intentional. It’s normal to think bad thoughts about your ex-partner when a relationship goes bad. It’s natural to have some ill-feelings towards your ex-partner when you’ve had to “battle it out in court” in order to get meaningful parenting time with your children. If you didn’t feel mad, angry, sad, and similar after such an experience, some might think something was wrong with you. Expressing your feelings is quite appropriate. It’s where and how you express those feelings that will keep everything on the home front the way it should be – safe, loving, and without a lot of anxiety. The places you might consider venting about your situation must, first and foremost, be far away from any chance of the children overhearing. No need to jeopardize your child custody arrangement and risk violating your child custody order at the same time. Friends, therapists, counselors, priests or other clergy are great places to shed those feelings of ill-will you may have lingering about your ex-partner. Children love both parents and your negative words will cause them to feel hurt for both of you. The children may learn to dislike or even “hate” the other parent due to your lack of self-control. 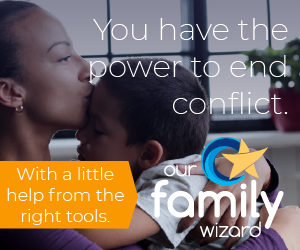 The children may develop a fear of the other parent (or even you) and start acting out during child custody exchanges or at one or the other household. The children may develop an unusually critical attitude towards you, your ex-partner, and others, too. The children may slip into depression and anger and act out physically towards others at home or at school. Remember, too, that children learn that they are supposed to be the best of both of their parents. When you denigrate the other parent and the children can see or hear it – you need to understand that, in their minds, you’re speaking poorly of what they believe to be a part of themselves. They begin to self-identify with whatever criticism you let fly in front of them. Now, all of this is especially tough if you’re dealing with an active parental alienator. Parental alienation takes a lot of work to counteract and can cause a great deal of frustration. Along with all of the other changes you’ve needed to make in your life, a greater level of self-control is necessary to avoid perpetrating parental alienation yourself, even if it may be occurring against you. Always remain positive in front of the children. Been there, done that, and the PA damage has been done with my 19 and 17 year old. It’s too late to turn back the pages and my ex has isolated our kids in her fantasy-freak world to the point I’ll never have the type of loving and warm relationship I had with my parents when being brought up. They never call me anymore, never really did, or write, visit, and they are less than 15 miles away. I chose a monster to marry but I didn’t know it at the time. And of course in a particular county in SC the ancient family court judges let the women take the kids. It’s an old-fashioned “tradition”. So, in a nutshell, those years are lost. Basically the only thing I can pray for anymore is that they do the best they can with the life they know. The world is a very screwed up place and will continue to get worse if young men don’t have guidance, knowledge, from somewhere, to understand that women can screw up a man’s life for the next 26 years simply by saying, “I don’t love you anymore, give me the kids and your money”. At my age all I can do now is struggle to eat and have a roof over my head and maybe if I’m lucky spend 10 minutes a year with those kids and let the past go.